Discharge date a big honkin’ ?????? I got my pink on!!! We aren’t going home today. Unsure WHEN we are going home. Plan (as I know it, could TOTALLY change on Monday) is to get over the worst of her RSV sickies, then figure out what we need to do (feasibly, per mom) to make Annabelle grow. The last I’ve been told is that we will not be going home until Annabelle gains weight. I’m unsure of how they plan to quantify that, as she’s lost quite a bit with her current illness. So is it gain up to a certain % (NO!!!! Mommy says…) or to just gain anything or to just “start” gaining again and get back up to where we were a few weeks ago?? 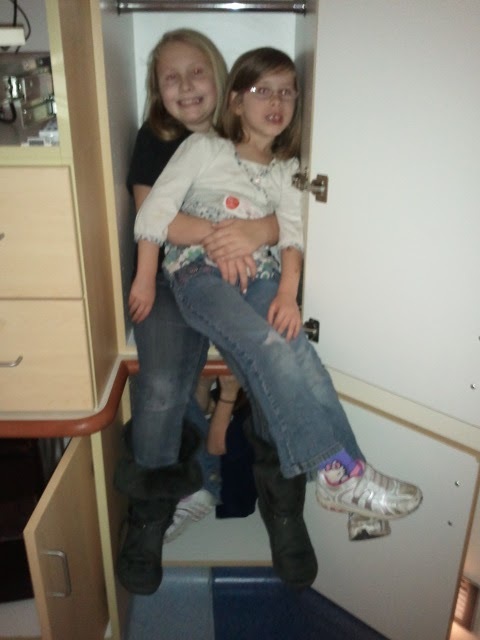 Big sisters visiting… & being silly! Yesterday we lost even more weight. 9.7 kg to 9.4 kg. That is around 21.3 pounds down to 20.6 pounds. In a day. She had been hanging out around 10 kg for a while (22 pounds). At her most, she weighed 23 pounds back in October/November. Talked with Nutritionist yesterday for a long time. Poor thing got all my frustrations vented to her, but she handled it well! I gave her all my blog-mom-comment advice that I’d been given. However, she wasn’t sure the hospital would view this as a valid way to increase weight in-patient (which I really do understand…mostly…) but if we can “plump” her up in a few days and get her home… hopefully we can tweak enough to get good calories, GROW, and still remain on an acceptable schedule that allows Annabelle to learn to EAT good foods by mouth! That said… we could be here for MUCH longer than I’d hoped/planned/expected. But then again, I need to clarify their goals and discharge requirements too, but that won’t come until Monday. For planning purposes, I’m “anticipating” us being in the hospital for a week. I have no idea if that is realistic, overshooting or undershooting. Please just pray for us as we try to figure this out with babysitting, Scott’s work schedule, and just all the logistics of a longer-than-a-day-or-two hospital stay. In our other hospital stays, I didn’t like to leave Annabelle, but I could when I “had” to. But she’s a toddler now. She gets into everything, gets bored easily, and needs someone with her most all the time. I do take breaks to go get food and things, but try to time those while she’s sleeping or super occupied. Plus… she needs her Mommy. She’s getting old enough to be “attached” which she wasn’t for a super long time because, well, she had so many nurses in her life it had to be confusing! She had LOTS of mommy’s! She isn’t fond of doctors or nurses now. She cries when they came up to her crib! Although, she doesn’t mind her main cardiologist since she sees her all the time. And they sing silly songs to her in clinic! Speaking of… we HAVE loved seeing all of our hospital friends! Annabelle saw both of her “primary” PICU nurses yesterday, along with some other super fun PICU nurse friends!! And reacquainting with doctors and NP’s and 6C nurses and RT’s and social workers… while we wish it would be on better circumstances, they all became a little like family over the last year and a half so it’s our own mini-reunion. They all think it’s mighty fishy that Anna Reese and Annabelle chose to come to the hospital just a day apart… AGAIN. (they did this twice I believe last summer!) Although they are on different floors this time, so I’m sure they are disappointed that it didn’t work out as planned! Okay, just talked to GI folks for a second. And I’m even more confused! THEY say they don’t want to mess with feeds until she is “over” this illness (which with RSV, could be a week or two) and then have a good plan in place for feeds and have close out-patient follow-up. Yet… cardiology and nutrition had made it clear that they’d like to “monitor” her in the hospital during the change in regimen and ensure she is gaining weight before we go home. SO I am back to the fact that I really have no clue. And need some chocolate. Oye. Hey Krista, we're still praying for y'all. … Know what you're dealing with. Even with suppressed immune systems, those little guys are amazing in how well they shake off colds (or RSV). We'll pray Annabelle gets well in a hurry (and also, that she begins to gain weight, too). 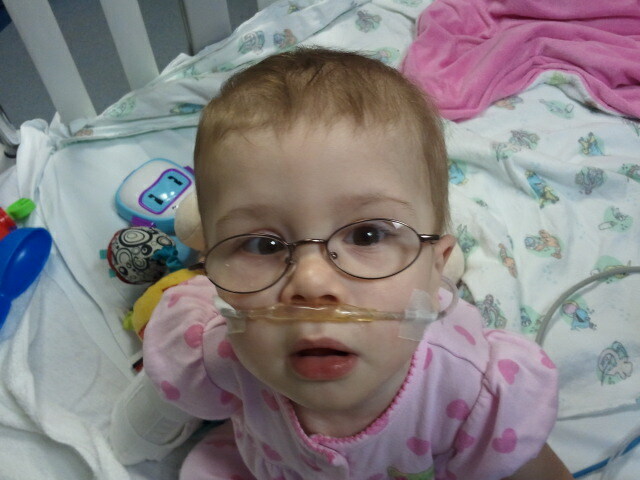 Just realized I didn't really update much about her RSV part of her stay! The main reason we are HERE! She's still on O2 all of the time, still has a pretty decent cough. But, she had all that at home. THe reasons we came in (watery stool, high heart rate, gagging) while not completely better, are better than what they were on Thursday. So that's good. Unsure, too, if they want to keep her here until she is "over" the RSV (aside from the "grow" thing) or if they will send her home with oxygen. Again, all good, questions that I have no clue the answer of. AT the moment we aren't doing anything I couldn't do at home… but are here "just in case" and are monitored much more closely. Okay, that's all from an RSV standpoint! Intrigued that coconut oil is out – that is a medium chain fat – I had to work so hard to find medium chain fats! Anyway it sounds to me like they would prefer oral eating not tube feeding….it was while we were doing the blended tube feeds that I could augment the calories with the oils and ground flax seed etc etc. On oral feeds that wanted her filled with food not empty calories. Hoping that by Monday they realise that home is best. And it's not that that is BAD, I just don't think it is the BEST solution for Annabelle. I'm glad that at least so far, they are listening to my concerns and we are thinking outside the box a bit. She is on lasix, but a small amount once a day. Personally I'm hesitant to suggest to stop it, because her lungs are junky at the moment (presumably from the virus) but it would make me nervous to stop a diuretic while having junky lungs! And her legs and arms are getting pretty scrawny looking lately, so I agree with them. She needs some calories! Anyway, yeah, it all is making my head spin!!!! I'm sorry your little gal is not doing well and that you're dealing with so much, Krista. Praying for your princess, her medical team, you, and the family back home. My you soon be reunited. Okay, funny. I just realized that I wrote "plumb up" instead of "plump up" on her board in tha tpicture. Well one definition of plumb is to weight with lead, so you were not that far off 🙂 Prayers for a speedy recovery and weight gain for Annabelle. How about MCT oil in her feeds? I would ask the nutritionist to actually seek out research articles regarding coconut oil or at the very least a source other than her fellow co-workers (I.e. Cincinatti Children's hospital or other top feeding hospital). There is a lot of research to suggest that while coconut oil is high in sat fat it's actually not "bad" for you due to the way it's digested in the body. I have even heard it described as heart healthy.